barley, oats, and corn; they also pasture freely in the fields and around the lake on the farm. 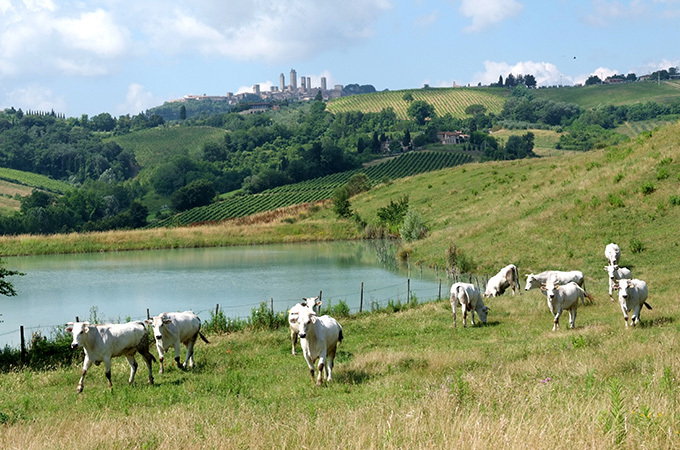 It is in thanks to this care and to the family experience in breeding animals that our T-bone steak, bistecca alla Fiorentina, is one of the most appreciated in the area. Chianinas are known for the quality of their meat, which is high in protein and low in fat and cholesterol. Many other excellent cuts of meat are obtained from this breed, some of which are perfect for traditional Tuscan recipes such as beef tenderloin, bollito various cuts simmered in a vegetable broth for two or three hours, spezzatino beef stew, osso buco, and stracotto another version of beef stew. 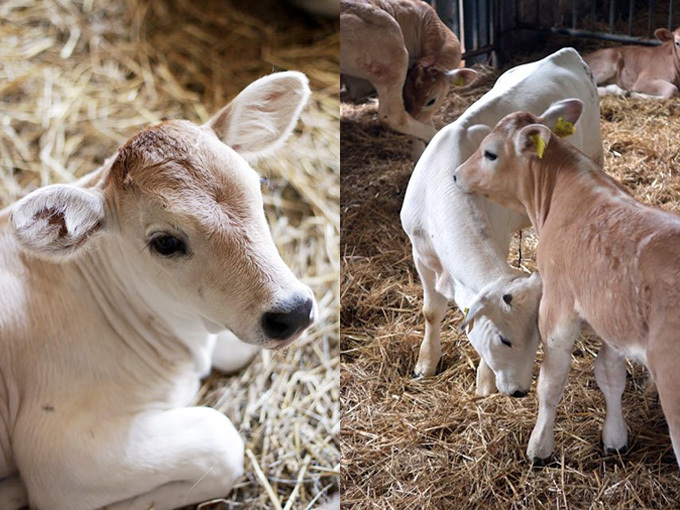 Two dairy cows, of a different breed, provide fresh milk that the families and guests of the agriturismo can enjoy every morning at the breakfast table. Our courtyard animals live free range and roam freely for food. We raise rabbits, guinea-fowls, and chickens from which we get the fresh eggs that we use for our homemade pasta and pies. Traditionally, winter is the time for butchering pigs, another deep-rooted aspect of farm and country life. This is when we produce our excellent salt-cured Tuscan prosciutto and the different salami, as well as a variety of other products that will be enjoyed at lunch and dinner time at the farm all year round. At the farm there is also a butchering house for processing meat and cured meats. You can purchase our products directly at the farm’s shop, or online.